Written at 08:15:24 on Saturday, 9th December, 2017. The set pictured below is the one I want to listen to at work and I have had it placed on the shelf next to my desk for a while, and had bundles of paperwork stacked on top of it, though this is about to change as the set is now undergoing a makeover to improve looks and performance. When I first got the receiver (and tested it!) I found that there is one electrolytic condenser in the set that filters the high tension electro-motive force coming from the rectifier valve. All other condensers are either the wax coated paper or those smaller Bakelite ones, all of which are still well within tolerance. While many collectors choose to replace the lot, on this occasion I didn't see this as necessary. This situation may change in the future as I plan on putting the receiver to a lot of use. Basically, it will be turned on all day, every day, when I am at work. The first thing I did before putting it on the shelf in my office is cut off the power cord. It was one of those revolting vulcanised Indian rubber (VIR) cords in the figure-8 configuration and was congealing at one end and laced with dry cracks at the other - not in a good state for plugging into the power point! A word of advice, don't even bother using a set with one of these cords - advice you will accept willingly if you value living. They are just too dangerous. When I took the set out of its cabinet I removed the valves, cleaned them with some alco-wipes and put them aside. I then cleaned the chassis with a toothbrush and a couple of alco-wipes to remove a large helping of dust that has built up over the years of storage. 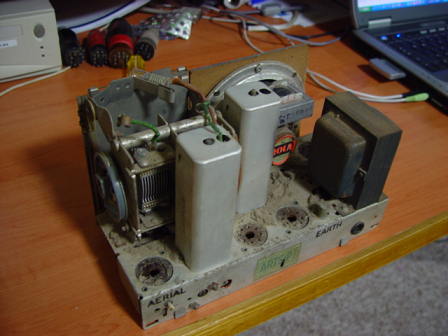 The storage of the radio must have been fairly good because the chassis is free of rust and other discolouration. There is also no piles of wax from dead condensers nor pitch from the transformer. I got out my trusty 80W soldering iron and connected a new power cord and got rid of the dead electrolytic condenser which has clearly overheated to the point where, if left in service, it would have caught fire and filled the room with acrid smoke. Ducon condensers, by comparison with today's condensers were of good quality, though like anything, they don't last forever. A lot of collectors think the old condensers were lousy but think of equipment made these days and try thinking about the condensers drying out in them. 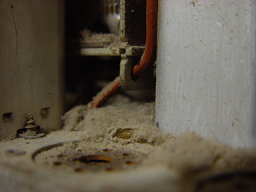 Today's condensers do fail in the same way as the Ducon product and with the same destructive results. The new condenser was then soldered in place and this unit is rated at 22μF at 450V which is just about the higher limit required for the job this component performs. After the new condenser and the new power cord were installed I checked the power transformer windings with a Megger to test the insulation resistance. All was well here so I installed the rectifier valve and powered up the chassis and did a few voltage checks to make sure everything was okay with the circuit and nothing was getting more oomph than was required. 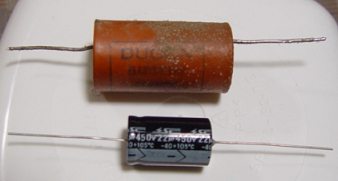 The rectifier valve was then removed and the chassis was left idle with the power on for about 30 minutes to test the transformer for short circuits that may appear when the temperature of the transformer changes as such faults are not always picked up by the insulation resistance check. After that time had expired the transformer was still stone cold. So far, so good. The chassis was disconnected and the valves were refitted. 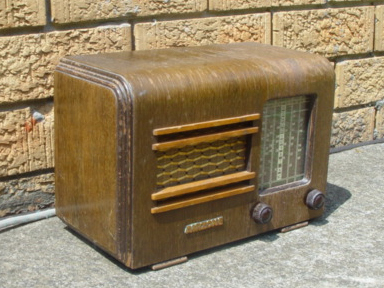 The radio was then fired up and the speaker pumped out 2CH (A Sydney station playing easy-going music which is relevant to the era these sets were made in) quite loudly and this was without an aerial, though the receiver had the benefit of the earth supplied by the three core power cord. To get this performance from a four valve receiver and without an aerial is a good thing. Then came the real 'smoke test' - playing the receiver continually for a whole day. Everything turned out to be fine. Australian made valve radios were of the finest quality available anywhere and there are few better examples that this set. This particular model was made just before the end of the Octal valve era and is a good example of miniaturisation with full-size components. There's not a lot of room on the chassis for a 5th valve or anything else really. After some pondering and measurements it has been decided that this set meets alignment specifications. For now I will dispense with the planned tune-up of this set as the sound coming from the 4 inch speaker is quite loud, even without an aerial and the dial pointer is calibrated quite well on the scale. Things have obviously not been fiddled with by someone thinking that the screws were loose. I will now describe some of the tricks I had to perform to get this fairly shabby-looking set looking like new again though just before going ahead with that I will explain something about restoring radios and it relates to how and when this should take place. I plan on writing a dedicated article about this at some stage though for now, this set was not working when I got it, due to faulty condensers and a perished power cord. At the same time the lacquer had degenerated to the point where it was getting all over whatever I sat the receiver on. There are some collectors that have a hard-line approach to restoration - ie: It should never take place. A set should be acquired and stored as found, no matter what. I disagree with this for several reasons, just the same as I disagree with the notion that everything that is found should be restored to factory standards. I fall into the middle here somewhere and I believe that most collectors do - restore if needed, otherwise tidy up a set, give it a bit of spit and a rub then that's it. With a decision made to restore the cabinet I pondered on several things. I am not a carpenter/joiner, so do I have sufficient experience? Is the set too old or too historically important to be restored by someone with my skill level - should it be restored by a carpenter and French polisher instead? Most commercially made receivers were never French polished, per se. A few coats of shellac doesn't always pertain to whether the set was French polished or not. It comes to how shellac is applied, among other things and that is why a French polisher is a skilled trade in its own right. French polishing is also extremely expensive and the technique would have provided the mother of all bottle-necks on any production line. In the case of the Airzone, I planned to strip back the remaining lacquer, sand back the veneer sufficiently so that any old traces of lacquer would not be present once the cabinet was repolished (known by some as toffee-apple effect) then painting the trimmings with a very dark brown gloss enamel paint, then applying shellac to the veneer. After this there was a view to applying a couple of coats of nitro-cellulose lacquer to the whole cabinet, however I am still unable to source any, despite being told a few years back that it is still made. The biggest mistake that can be made with a wooden radio cabinet is using power tools to get the job done quicker. I got a blister on my thumb from the manual sanding that this cabinet required, though the small amount of pain involved was easier to put up with than looking at the damage caused by a belt sander, electric file or similar implements. Don't be tempted to use these things - it will lead to disaster. You have been warned. 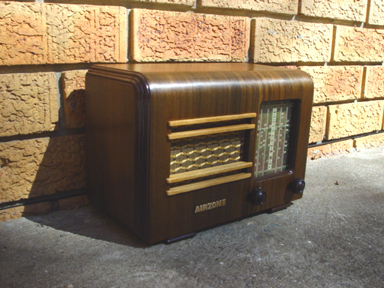 The main reason for the above warning is because the veneer on an old radio is seldom more than half a millimetre thick, one millimetre at the most and usually only on the bigger sets. Power tools can and will chew straight through it, licketty split, and there is no point of return from here on. The other thing is that all the veneers I have come across are made of fairly soft woods. You have it all against you if you want to be impatient. I sanded this set back fairly easily as the lacquer was in quite a degenerated state. Most if it simply flaked off. I used sanding gauze for most of this as it is quite durable but not as harsh as emery cloth and it doesn't leave as much mess as traditional Garnet sand paper. For getting a very smooth finish, I used a fine grade of 'wet and dry' paper. Once the sanding is done it was time to fix a small area of the veneer that had started peeling off the set. This was in a quite inconvenient position but the job still had to be done, especially since it was on the front of the cabinet. Leaving it unrepaired would have provided a rather out of place and annoying focal point. After digging out any dirt and loose wood grain I applied some wood glue to the area and held the veneer down with a clamp. This is shown in accompanying pictures. After this repair the cabinet was inspected for any further deterioration and then washed thoroughly, making sure that there wasn't too much water put on the cabinet. This is because the glues that were originally used on these cabinets, along with the Aquadhere I used, are water-soluble, meaning that they soften when immersed in water. The cabinet was padded with a towel and then left to dry for 24 hours. Some more preparation work is required before applying any finishes to the cabinet. The routed trimmings along with the feet of the cabinet needed filling with a spirit based wood filler of the right colour. It is considered the norm to just take some filler, pictured above and available from Bunnings (BBC Hardware), on your finger and simply rub it in to the rough parts of the surface. Then simply leave the set for the time recommended by the manufacturer of the filler so that it dries correctly before sanding smooth. It may well be necessary to do this twice and this was the case with this set. Be sure to sand thoroughly between applications otherwise you will end up applying so much that you won't be able to sand it efficiently. Before painting the routed areas I gave the cabinet one final dusting with a slightly damp cloth to make sure there was no dust left on or in it. I then mixed some shellac flakes into a quantity of Metho and stirred the mixture until the flakes had completely dissolved. The mixture was then ready to rub on with a clean cloth. By the time I'd finished I'd rubbed on about 10 coats of shellac and let each coat dry before applying the next. Being spirit-based, the drying time is quite short. What is shellac made of? There are two types of shellac. Shellac that occurs naturally comes from a resin-based secretion from an insect called a lac, originating in India, though is present in a couple of other countries. Man-made shellac was based on coal tar before the Industrial Revolution, though the Germans worked out ways of mass-producing shellac which was based on the original lac resin and machinery is used to make shellac flakes based on this even today. According to some, shellac comes from cockroach wings or beetle poop. None of these stories are true. 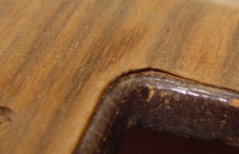 This receiver has a handful of decorative trimmings which have been shaped using a router. I couldn't get a colour of brown that I was after and Mission Brown is too light for what I wanted to achieve here - so I bought a sample pot of that and another of black - both in gloss enamel for the smoothness enamel has. A mix of the brown and black gave me the dark brown colour I wanted, very close to the original. A coat of the mixed paint was applied to the required areas with a small art paintbrush. As the paint was enamel there was very little chance of seeing brush strokes after the paint had cured and this is what eventuated. The cabinet was then left to dry for 48 hours. I wanted the enamel to be quite hard before sanding it. Two days later I sanded the enamel with the same wet and dry paper used to finish off the veneer with. I then cleaned the cabinet with a dry cloth to get rid of any dust and then applied a second and final coat of enamel. This coat dried over the next day or so into a hard, smooth and shiny surface which came to represent what had been applied originally. It was then time to pay more attention to the veneer and a total of no less than 30 more coats of shellac were applied over the next week or so, giving each coat time to dry adequately. The cabinet was then given a final dusting with a clean dry rag and set aside whilst the four pieces of whitewood that form the speaker grille were sanded back, using the same method as per the veneer, and coated with several layers of shellac. When these were dry they were glued to the cabinet with the PVA wood glue used to repair the veneer. The set's name badge needed some work. It seems to be made of some sort of bronze alloy and there were some patches of green corrosion present, along with around 60 years of tarnish. The front of the badge was sanded with very fine wet and dry paper, then it was scrubbed quite hard with a nail brush and Solvol soap to get rid of the grime between the letters. To prevent any new tarnish developing I coated the badge in a layer of shellac before bolting it back onto the cabinet. The two control knobs needed some treatment too. They were scrubbed with piping hot water and a nail brush with a few drops of dishwashing detergent. They soon scrubbed up quite well. The chassis, which was still clean from its restoration some months ago now, was then bolted back into the cabinet and the two knobs were fastened to their pot shafts. The radio provided some much needed aural therapy that afternoon - there is nothing quite like the sound that comes from a valve radio. It is pure, clean and powerful. This radio now takes pride of place on a shelf next to the desk in my office at work. It spends a good portion of each day relaying Sydney radio station 2CH to my ears. I've connected the antenna wire to the building's MATV system which means I am getting the best possible aerial. As for the radio itself, it looks like a bought one. Bands: AM 531kHz - 1680kHz. Valves: 6X5GT, 6A8G, EBF35, EL33A.